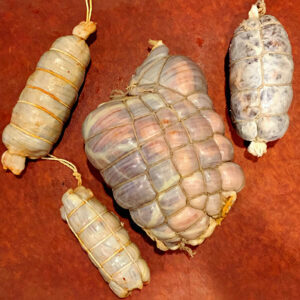 A few days ago I had to butcher a whole ham leg from a gorgeous Managlista pig to get a Culatello and Fiocco out of it. I love Managlitsa meat so much that I prefer as much as possible to cure whole muscles with it. It seems a waste to me grind it into a sausage. Nothing against sausages, I do love them too. 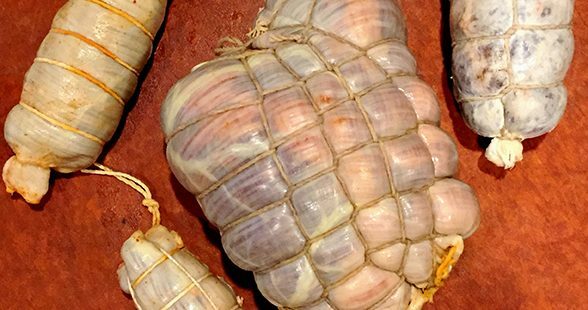 When cutting out the culatello/fiocco, there are some parts at the top and bottom of the ham leg that are not included in the whole muscle cure for those. So this time, I took any larger chunks of muscles to experiment and cure them whole. I noticed when curing whole ham legs (Prosciutto/Jamon Serrano) that the ends of the muscles towards the ankles have a very deep red and intense flavored meat and these are some of the parts that do not make it into the culatello/fiocco. They also have lots of tendons and silver skin. I took those parts out, cut off as much of the hard tendons and removed as much silver skin as possible. None of these pieces have any official curing name that i know of, they are just random chunks of muscles that typically would have been ground to make sausages. I’ll called them “Spare Parts”! Following the theme of “spare parts”, I have kept some random pieces of beef bung that were left over from casing other whole muscle cuts and a chunk of hog middle casing. i used them here to case these guys. 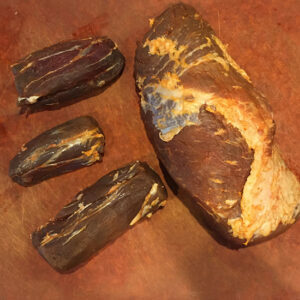 They are now sitting happy in the curing chamber!